The emblem on Canada’s flag and on our penny is inspired by the maple leaf. Most of Canada’s maple trees are found in eastern Canada. But it’s the Norway Maple which adorns many of our properties in Revelstoke. In fall, Norway Maples hold onto their yellow leaves a bit longer than do other trees found here in the Columbia Mountains, making them conspicuous at this time of year. While walking on the Nels Nelson trail recently, I was surprised to see to what extent they have established themselves on the lower slopes of Mount Revelstoke National Park, particularly below the Ski Chalet where there are tree up to 40 centimeters in diameter and sstill growing. There are 150 species of maple worldwide, mostly found in Asia. 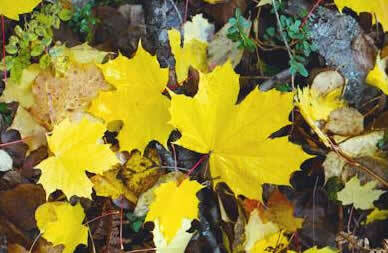 Canada has 15 species, of which the Douglas maple is the only one naturally found here. Native to Europe, Norway Maples are commonly planted in urban areas and are well known as invaders. They produce seeds fitted out with wing-like structures to aid in their dispersal. As a result of windstorms, these trees are now expanding their range to the lower slopes of Mount Revelstoke. National parks are managed to maintain their ecological integrity, which means keeping all the parts of nature working together forever as they naturally would. But does this include species that don’t naturally occur here? Plants that occur where we don’t want them, on our lawns, gardens, roadsides, pastures and so on, are referred to as weeds. But this is a human distinction. In nature, all plants compete for space, light, nutrients, and moisture. Whichever plant is best adapted to its growing conditions will be the one that succeeds. What we call weeds are plants that are best able to compete in altered environments. Vehicles on our highways pick up all kinds of seeds from all over the continent and leave them behind elsewhere. Some of these seeds take root and out-compete native plants on our roadsides, which are poor growing sites for native plants of the interior rainforest. But few of these road warriors of the plant world are able to live in a shady forest. Staff from Mount Revelstoke and Glacier National Parks monitor the spread of non-native plants in the parks and a summer crew, known as the “Weed Whackers” pull weeds by hand along the Trans-Canada Highway to assist provincial agencies in controlling the spread of the more noxious plants, such as knapweed. Knapweed can take over extensive areas, and lessen crop yields and quality for farmers across western Canada. Norway Maples on Mount Revelstoke have nothing to fear from the Weed Whackers as the maples are unlikely to interfere with the ability of native species to persist through time. But they serve to remind us of the porosity of ecosystems, the artificiality of boundaries, and that there are still things to be discovered, even in our own back yard.